Under the pilot program, if your Scion xB isn't big enough for the task at hand you can arrange a short-term loan of a larger vehicle — perhaps the Toyota pickup, below. NEW YORK -- Scion is rolling out a pilot program that will allow vehicle owners to use other Toyota models as short-term loaners. "The idea is the person purchasing a Scion gets limited access to the Toyota vehicle family," said Scion Vice President Doug Murtha. "So someone with an xB can get hold of a pickup or a van if they need it." 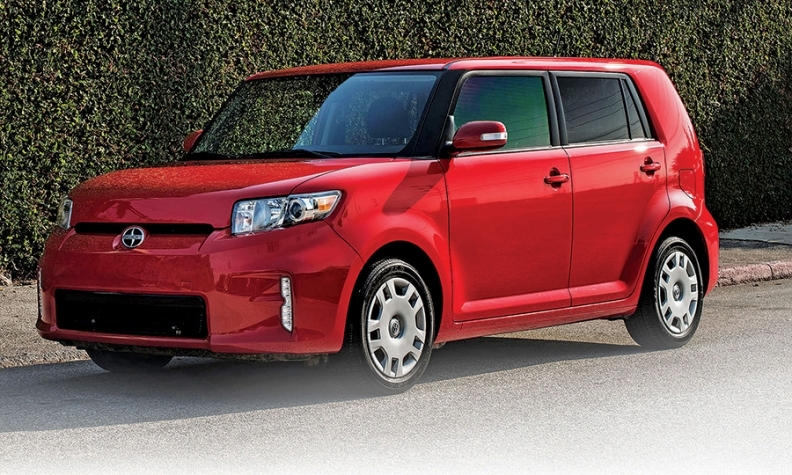 The Scion Swap program will be tested at dealerships in Miami, Houston and Phoenix. Such concepts are one reason Toyota created Scion -- as a way to test ideas without involving the entire Toyota owner body. By using Scion stores, it can test smaller batches of customers but expand programs across the Toyota network if they prove successful. About 1,000 of Toyota's 1,200 dealers carry Scion. Details are still being ironed out, but the Scion Swap Web site says Scion owners can get 10 complimentary rental days a year, although the Scion owner will be responsible for refueling and any damage. There are some mileage restrictions that rule out lengthy road trips. Scion Swap dealers are offering rentals of the Camry, Sienna, Tacoma and Prius, though some dealers may have additional models available. Reservations are made through the Web site. The program is currently undergoing what Murtha describes as "a systems check with dedicated software to enable the process." He said the software is "working really well." Later, the automaker will examine consumer take rates and market interest. "It's still really small scale. How it shakes out, we still don't know," he said. The best-case scenario is that the program will go nationwide, although there is no specific timetable for such a rollout. Meanwhile, Scion dealers are hoping to have more customers to test the program. Although the brand has sold nearly 1 million vehicles since its 2003 California launch, sales have tapered since the recession as Gen Y buyers have had trouble getting financing. But Scion will introduce three vehicles over a two-year period starting next year. The first will be unveiled at the Los Angeles Auto Show in November. Murtha declined to specify the category or segment of the vehicles, but hinted at a possible direction. "Scion has always been about entry compact and subcompact, and that will remain our center of gravity," he said. "Would we be interested in other body styles? The answer is always yes. We may mix things up a bit as we find a new direction for the brand." Both the xB and xD hatchbacks are seven years into their product cycle -- this for brand that promised quick-change products that wouldn't go stale. A year ago, Toyota executives said they were studying a possible move further upscale for the brand. But it appears that attracting first-time buyers remains the key quest. Toyota sources said that they are looking into importing the next generation of the Toyota Auris hatchback from Europe. A derivative of the Mexico-built Mazda2 subcompact that Toyota will share could find its way into the Scion brand. And Toyota executives are intrigued by the subcompact crossover segment, occupied by the Nissan Juke and Honda's upcoming Fit-based HR-V.
"Any new vehicle you want developed needs friends [in other markets]," Murtha said. "We need to vie for company resources. It's true for Toyota and Lexus, and it's true for us. Are we likely to get dedicated North American Scion products? That's a hard sell. We're looking for global partners in Japan and Europe who want a similar execution."